Vintage is changing the way you nurture your pet by blending fresh and whole foods to maximize bioavailability of nutrients. Mother nature intended ingredients in their complex and whole nutritious form to satisfy your pet’s energy requirements. Our homestyle Oven-Fresh feline recipes are made with carefully selected premium fresh meats complemented by market fresh produce. We have trusted Canadian partners that supply us with 1st cut proteins which are antibiotic and hormone free. 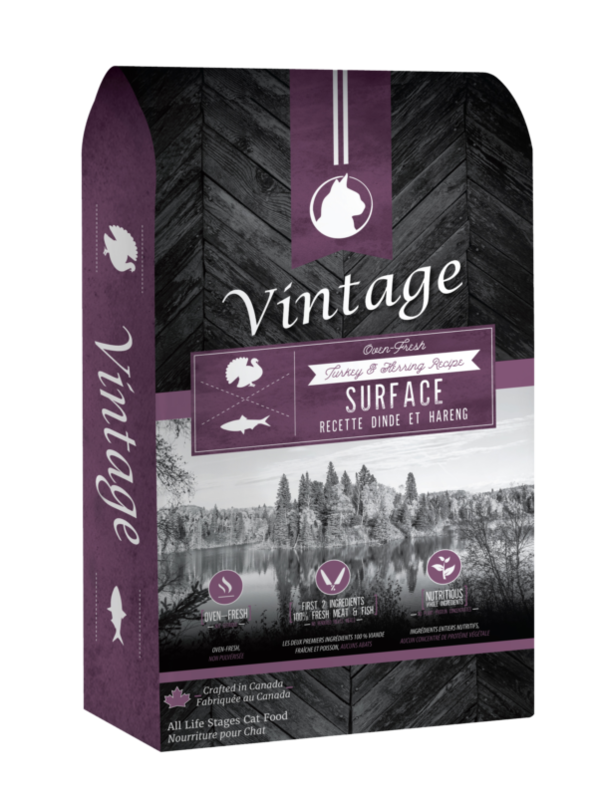 Vintage Oven-Fresh recipes are gently and slowly prepared in small batches in the oven to insure superior nutrient retention for your companion. Our goal is to provide nutritious foods to help nourish your pet’s soul with every bowl. Prebiotics to maintain a healthy digestive tract. Available in 4.54kg & 1.81kg bag sizes. Vintage Oven-Fresh Turkey & Herring Recipe Cat Food is formulated to meet the nutritional levels established by the Association of American Feed Control Officials (AAFCO) Cat Food Nutrient Profiles for All Life Stages.